A mother supported by Rainbow Trust Children’s Charity, is looking forward to spending Mother’s Day with her twin daughters after doctors told her they probably would not survive. 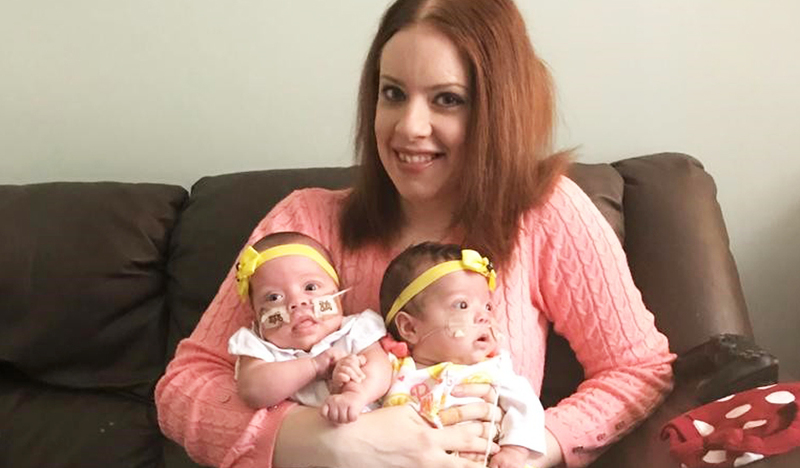 Ella-Mae’s non-identical girls, Bella and Ruby were born 14 weeks early, weighing 910 grams and 900 grams respectively. They have chronic lung disease, requiring 24-hour oxygen. Ella-Mae spent three months of her pregnancy in hospital or on strict bed rest to give her babies the best chance. Despite being told by doctors at her 12-week and 20-week scans that she should prepare for the worst, against the odds they survived. The twins moved out of Guys and St Thomas’s neo-natal ward and back to their Westminster home in mid-January and Rainbow Trust Family Support Worker Fiona has been supporting Mum, her fiancé Giovanni and the girls since then. Rainbow Trust has eight care teams of Family Support Workers across England, including two in London, helping families at home, in hospital and in the community, making life a little easier wherever they can. Fiona has been providing emotional and practical support to the whole family, helping them adapt to moving the girls back home, taking them to hospital appointments, helping the girls with their oxygen and providing their parents with some much-needed respite. She spoke of her relief when her twins pulled through. Ella-Mae and Giovanni are hoping to take Bella and Ruby to a hotel to celebrate Mother’s Day. Bella and Ruby are gradually being weaned off oxygen and are not expected to have any long-term health problems. They were born on 31 October and due on 2 February.